The deciding factor in Panasonic’s move of its North American headquarters from Secaucus, New Jersey to Newark was public transportation, according to Jim Reilly, vice president of corporate communications. The company relocated from a large corporate campus with lots of green space to an amenity-rich downtown location. Reilly said his company’s relocation has been “transformative” and has created a more collaborative company culture. After years of locating in car-dependent, suburban office parks, large numbers of companies like Panasonic are now moving back downtown. This job migration is occurring across the U.S. in small cities and large alike. What all of these locations have in common, according to a new report from Smart Growth America, is that they are walkable places with good public transit. Smart Growth America, the real-estate firm Cushman & Wakefield, and George Washington University’s Center for Real Estate Analysis examined nearly 500 companies that have relocated, expanded, or opened new offices in downtown locations over the past several years. The diversity of businesses is enormous. They include 52 companies on the Fortune 500, and 12 of Fortune’s 2015 list of the 100 Best Companies to Work For. They range from small enterprises of just a few employees to corporations with thousands of workers. By interviewing executives at about 100 of these companies, Smart Growth America learned that companies chose to leave suburban office parks for central business districts (and other walkable downtowns) primarily to retain their competitive advantage. To support “triple bottom-line” business outcomes (that is, to be a good corporate citizen). Access to transit may not have been directly cited as a top motivator behind the relocation of these 500 companies, but it was a common factor in every one of them. Smart Growth America measured walkability and transit accessibility of companies’ offices both before and after a relocation, and found improvements across the board. Walk Score averages prior to business moves were 52 (somewhere between “somewhat walkable” and “car-dependent”). For the new, downtown location, it is 88 (between “very walkable” and “walker’s paradise”). There were increases in Transit Score and Bike Score also, though less dramatic. Corporate America’s move from suburban office park locations on the periphery of a metropolitan area to downtown locations in the central business district is still a relatively new phenomenon. The majority of businesses (and jobs) are still located outside the urban core. That’s good news because placing companies where more people will have more and better transportation options, other than just driving alone, will create a barrage of positive societal side effects. 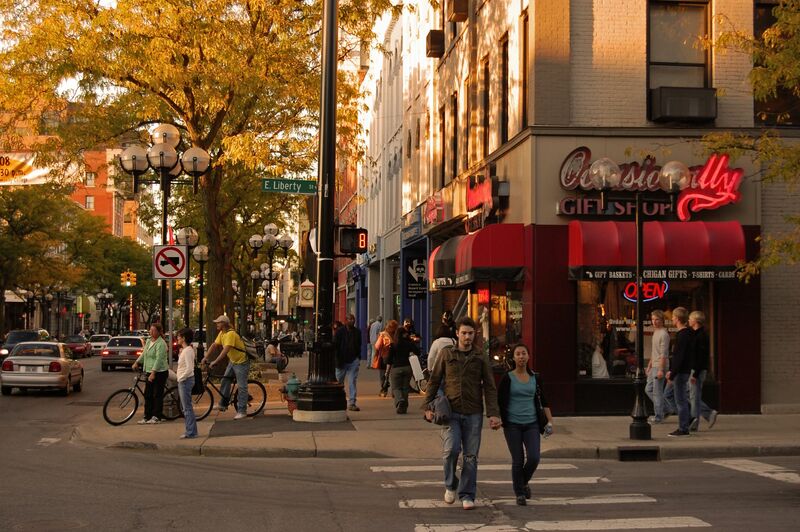 Photo of downtown Ann Arbor, Michigan by Ian Freimuth.